"It s a Wonderful Life"
Hollywood is probably the most important ambassador of American culture. People in other lands want to drive flashy cars, drink Cokes and eat at fast-food restaurants because they saw other people doing it in a Hollywood movie. If it is good enough for the people on the screen, then they want it in their life, too. 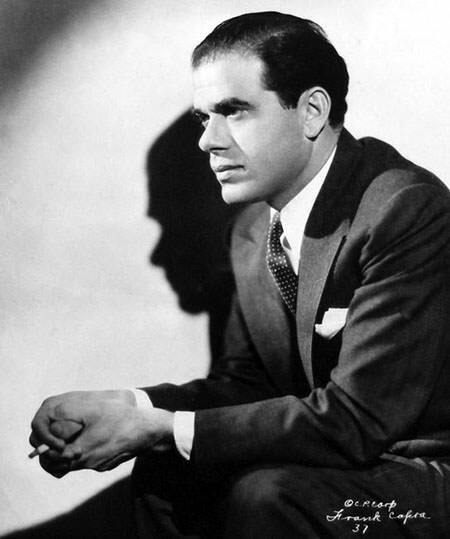 With this in mind, it is almost prophetic that the quintessentially American movie director, Frank Capra, also personifies the American dream of the immigrant who makes it in the Land of the Free. Francesco Rosario Capra was born in Sicily, 1897, and boarded the S.S. Germania with his family for the journey to America when he was five. The steering-class crossing left a strong impression on young Frank, as the Atlantic was filled with storms for the whole 13 days, but at the end of the trip, he saw "a statue of a great lady, taller than a church steeple, holding a torch above the land we were about to enter". At the sight, his father exclaimed: "Ciccio, look! Look at that! That's the greatest light since the star of Bethlehem! That's the light of freedom! Remember that. Freedom." It was a lesson that would shape Frank's career. After processing at Ellis Island, the family boarded a train West to Los Angeles where older brother Benjamin had already settled. They subsisted on bread and bananas because with their limited English it was the only food they knew how to ask for. Frank began attending Castelar Elementary School in the fall of 1903 and entered Los Angeles Manual Arts High School in 1909. His first brush with showbiz came when he was selling newspapers in downtown LA with his brother Tony. When sales were slow, older Tony would punch his little brother, and passersby would break up the donnybrook. After Tony had been chased away, with tears in his eyes little Frank had an easy time selling his papers. After high school, Frank attended the California Institute of Technology, and fell in love with poetry at the school's fine arts department ("I discovered poetry at Caltech, can you imagine that? That was a big turning point in my life. I didn't know anything could be so beautiful.") He tried his hand at writing at the school, and went to work in the campus laundry when his father died. He enlisted in the Army in 1917, even though he was not yet a naturalized citizen, and was assigned to the Coastal Artillery at San Francisco's Presidio just a month before the Armistice was signed. When he became a victim of the Spanish Influenza pandemic he was discharged and went back to Los Angeles to live with brother Benjamin while recovering. Capra answered a "cattle call" for extras on John Ford's The Outcasts of Poker Flat (1919). While working on the picture, Frank introduced himself to the star, Harry Carey. (Two decades later, Carey would be nominated for Best Supporting actor in Capra's Mr. Smith Goes to Washington (1939).) His first steady movie work was as a writer for the soon defunct Tri-State Motion Picture Company in Nevada, and for a short time with Harry Cohn at CBC Film Sales, the poverty-row precursor to Columbia Pictures. Hal Roach hired Capra as a gag-writer for the Our Gang series, and after writing for five in the series, he asked for a chance to direct. Roach already had a successful director in Bob McGowan, so Capra went to work for Roach's rival, Mack Sennett. Sennett's hottest property was comedian Harry Langdon, who eventually left Sennett's studio to make a go as an independent, and took Capra with him as a gag writer, soon promoting him to director. However, Langdon let him go when his pictures began to lose money. In 1927, Capra went to New York to direct For the Love of Mike (1927) starring Claudette Colbert. Capra and his star did not get alone, the picture went over budget and became known as his only flop. He was forced to hitchhike back to the West Coast, but soon after arriving home, his old boss Harry Cohn had opened Columbia Pictures. Although it was still a "Poverty Row" outfit, Cohn had major ambitions, and thought Capra would fit into them, and hired him as a director for $1,000/picture. He began to rethink it after seeing his early work, however. Cohn almost fired Capra after watching the rushes from his first three days of shooting. Everything shot the first day was in long shot, medium shot the next, and all close-ups on the third day. Capra later related: "It was so easy to be better than the other directors, because they were all dopes. They would shoot a long shot, then they would have to change the setup to shoot a medium shot, then they would take their close-ups. Then they would come back and start over again. You lose time, you see, moving the cameras and the big goddamn lights. I said, 'I'll get all the long shots on that first set first, then all the medium shots, and then the close-ups.' I wouldn't shoot the whole scene each way unless it was necessary. If I knew that part of it was going to play in long shot, I wouldn't shoot that part in close-up. But the trick was not to move nine times, just to move three times. This saved a day, maybe two days." Because of his engineering background, Capra was better suited for talking pictures than most directors then working in Hollywood. In fact, he was never really comfortable working in silent pictures. His first big hit came when he was paired again with Claudette Colbert (over her strong objections) and Clark Gable in It Happened One Night (1934), a film which cemented all three on the Hollywood A-list. By 1936's Mr. Deeds Goes to Town, critic Alistair Cook observed the Capra was making movies "about themes instead of people". 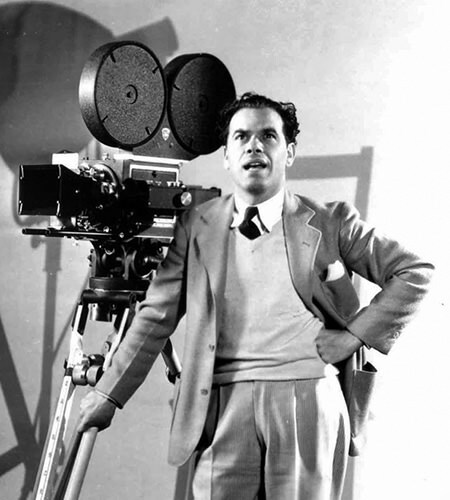 Capra's films began to carry a message of hope and that " let every man, woman, and child know that God loves them, that I love them, and that peace and salvation will become a reality only when they all learn to love each other". The greatest expression of "the Capra myth" was Mr. Smith Goes to Washington (1939), which also expressed the importance of believing in the American Way while the clouds of War were spreading over Europe. 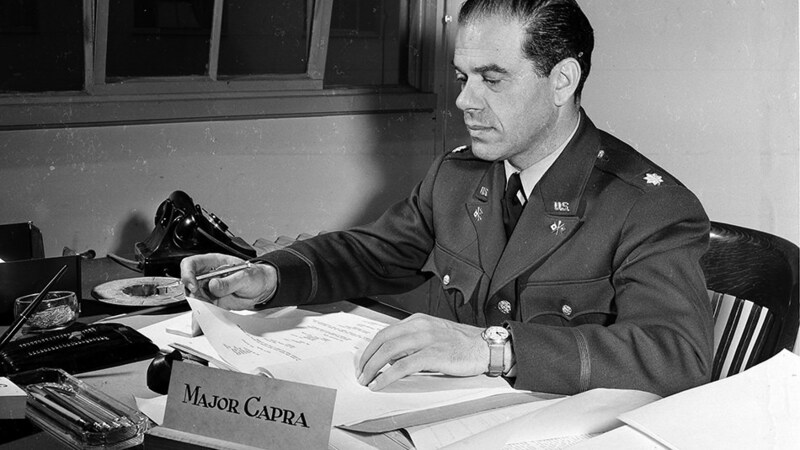 Just four days after Pearl Harbor, Capra gave up his directing career (and presidency of the Director's Guild) to accept a commission as a Major in the US Army. At 44, he was not asked to join, but he was determined to demonstrate his patriotism for his adopted country (as a WWI Vet, he had been naturalized in 1920). He worked directly for Army chief of Staff George C. Marshal, creating films that largely answered the Nation's question "Why are we in uniform?" the result was the seven-episode documentary series Why We Fight. Capra's post-War efforts were criticized as overly-idealistic "Capra-corn", but scholars have reassessed these films and recognized their true value, especially his best-known work, It's A Wonderful Life (1945). Capra himself began to be disillusioned by the Hollywood machine, perhaps in part due to the witch-hunt tactics of the House UnAmerican Activities Committee. Although Capra was never called to testify, many of his closest associates and people he respected were targeted by HUAC. The decline of the Studio system and the rising power of Stars helped to force Capra into an early retirement. He saw this as impacting his artistic integrity. He tried to enlist in the Army at the beginning of the Korean Conflict but was denied because of his age. A Star on the Hollywood Walk of Fame at 6638 Hollywood Blvd honors Frank Capra's contributions to Motion Pictures. 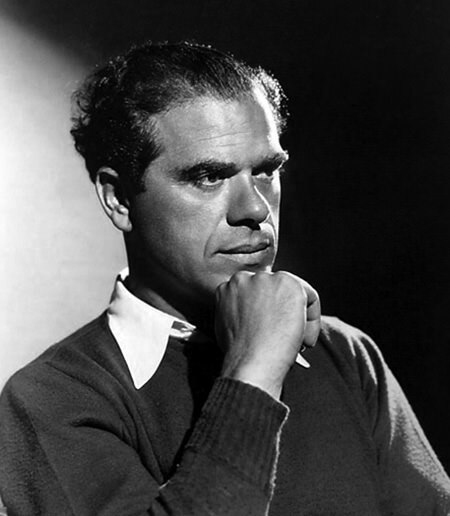 Be the first to comment on "Frank Capra"